…and raised his arms above his head to stretch tired muscles. The extra-large Aeron chair creaked under his considerable weight. Gazing at the ceiling he emitted an expansive yawn. He and his team had been at work for several hours. “Hey! Need some coffee here!” he yelled to no one in particular. Although several heads turned briefly in his direction, no one responded. Dawson grunted, acknowledging the usual indifference to his demands. “Get it myself!” he announced to his computer screen. Grumbling he rose and wandered toward the coffee machine in a far corner. Tommy Dawson, Ph.D., Nobel Laureate and senior fellow of the New Mexico Institute, was deeply respected by all—but this spacious research center held enough accomplished physicists and engineers to staff a first-class university and none were prepared to become Dawson’s personal errand boy or girl. He was a round man. Round head, round body, round like the Michelin Man. His face was round, too, with sagging jowls and at least two double chins, the result of too many sugar-laden drinks and donuts. His cheeks were colored by rosacea and although he shunned alcohol his nose was cherry red. Dawson’s dark hair was shaggy and striped with gray. He wore a custom-made baseball cap featuring a stylized atom and the words “Quantum Cowboy.” The greasy hair on the back of his head had been threaded over the adjustment strap of the cap to create a sad approximation of a ponytail. Dawson wore a stained T-shirt imprinted with a picture of a cat. There were actually two images of the cat, superimposed. In one the cat was sitting up attentively, in the other it was lying with its legs sticking up in the air, apparently dead. A legend in old-style Germanic script read: “Schrödinger’s Cat.” There was a large coffee stain on the front of the shirt. His casual appearance was completed with a pair of faded jeans and suede roper boots. 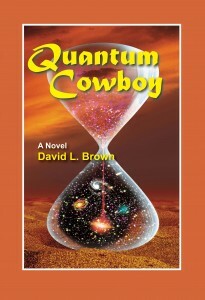 QUANTUM COWBOY, a Novel by David L. Brown. ISBN #9780996608558. Trade Paperback 467 pages, approx. 143,000 words. Retail Price: $14.95. AVAILABLE SOON in the Moab BookWorks edition on AMAZON.COM. Originally issued by Booklocker and still available on Amazon at $19.95.